I really love living in Naples. I enjoy almost everything about it. One major downfall is the fact that we do not have a Lozanos. I need to either drive an hour to Immokalee or an hour to Lehigh in order to get my Lozanos fix. This is really too bad because Lozanos is just so absolutely amazing & magical. If we had one in Naples, I would totally be visiting it on a weekly basis. For sure. Not a doubt in my mind. But, alas, we do not and the only way to get my fix is to drive the hour to one of the given locations. I try to think of excuses to have to visit one of these locations but often times, it simply doesn’t work out. We were planning on going to Ft. Myers to meet some family on Monday after Christmas. We ended up suggesting meeting in Lehigh at none other than Lozanos! Yay! Lozanos! Yipee! Let’s go now! We setup the plans to meet at Lozanos the night before and I was just overly thrilled. I already knew that I would be ordering hard tacos but also planned on ordering another item so that I could review that here. Yes, I am always thinking of all of my loyal followers. We arrived at the Lozanos in Lehigh and found it to be about double the size of the location in Immokalee. It was very nice inside as well and we found our seat. I ordered water to drink and began munching on some chips. The chips are so fresh, simple and tasty. The salsa they provide is very liquid-esq but, still provides adequate flavor. For my lunch, I ordered 3 ground beef hard tacos, served with rice and beans, along with one chicken soft taco on a corn tortilla. Since I have already shared my insane love for the hard tacos, we will simply discuss this chicken soft taco in this review. My biggest beef with Lozanos on this visit, was our waitress. She was very slow. Very very slow. It seemed as if the tables around us were receiving their food much faster than we were. I stayed patient purely because I was so craving this delicious food. Our food finally arrived and looked great. 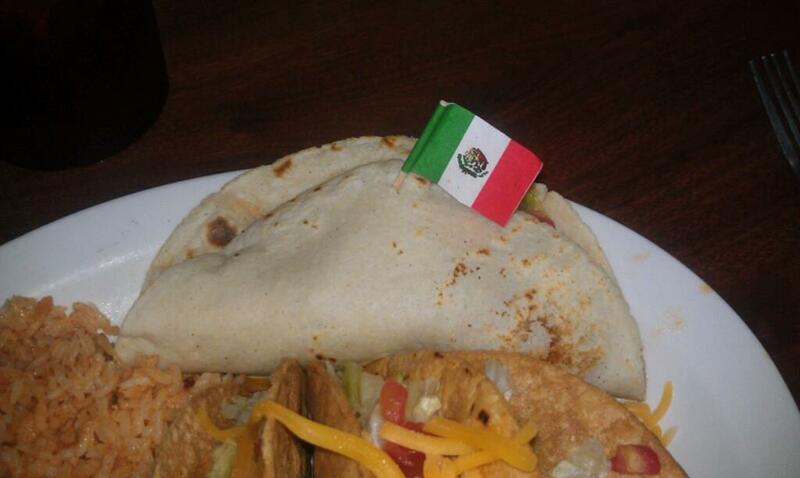 I had a huge portion of rice, beans, 3 great looking hard tacos and a soft taco with a nice flag of Mexico sticking out of it. Ole. Since I have already expressed my love for the rice & beans and hard tacos, let’s dive right into the soft taco. I normally prefer flour tortillas but opted for corn for the sake of this review. The corn tortilla was thin and certainly homemade. It had simple flavors and did a good job of holding all ingredients inside of it. I cannot say that it really had a lot of flavor because it just didn’t. It was a good, homemade tortilla but, I think a flour tortilla would have been better. The chicken within the taco was shredded and marinated. It was cooked with chopped up onions and peppers which only enhanced the flavors of the chicken. The chicken was so moist and you could tell it was simmering for hours. I could pick out flavors of pepper, cilantro, cumin and oil from the chicken and mixed in grilled veggies. 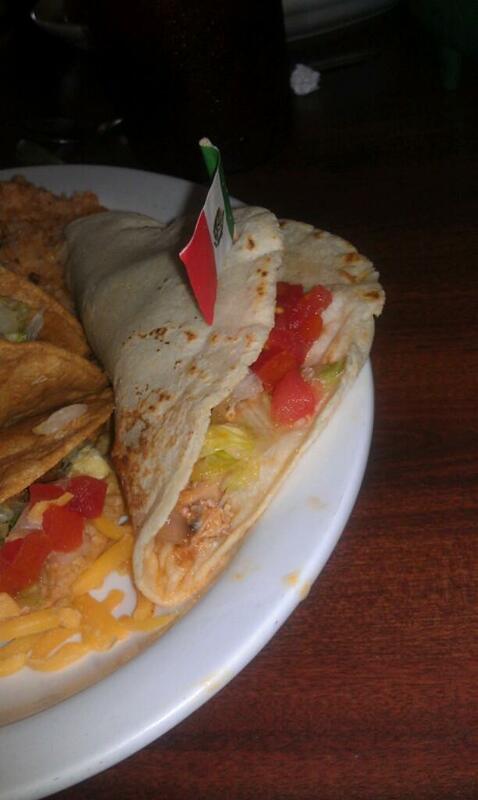 The taco also had tomatoes, freshly shredded lettuce and cheese. I then also added some sour cream to the tacos. I felt by the time that I ate the soft taco (after I had all the hard tacos), the insides had made the shell a bit soft. Still, the shell was able to hold up and contain all of the great fillings. I loved how the warm, moist chicken worked with the cool lettuce, cheese and sour cream. It meshed so well together with the tortilla putting it all together. The tortilla added an extra layer of basic flavor and texture that allowed the fillings to be enhanced rather than diminished. While I am usually not a huge fan of soft tacos, this taco was good. Much better than I expected and it would have been even better if I didn’t allow the tortilla time to get soft. You really just can’t beat Authentic Mexican food. Nothing even comes close to it. I don’t think that I will be moving from hard tacos to soft tacos when I visit Lozanos but, I am glad that I tried the soft taco. If you are a fan of soft tacos, you just can’t beat this taco. The fillings were the star in this taco. Quality ingredients cooked the right way. Fantastic food that is simply mind blowing – this is what you find when vising Lozanos.